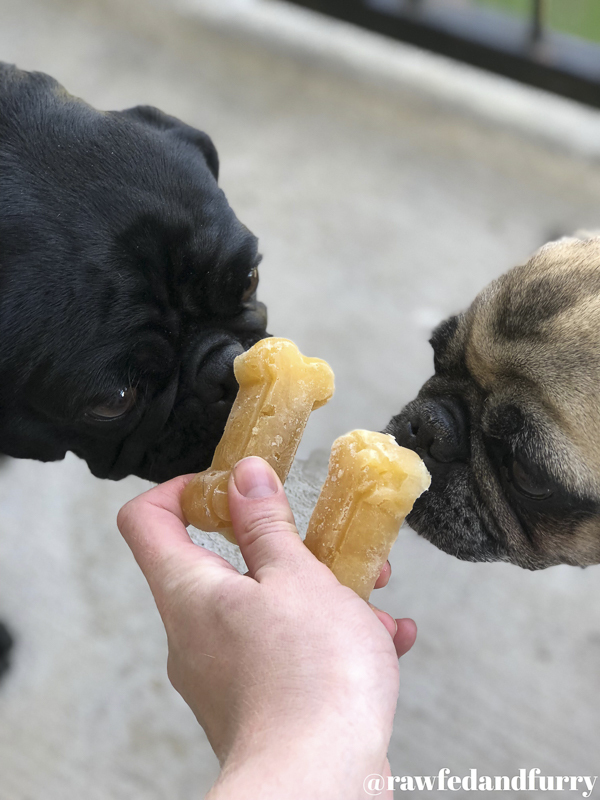 As the owner of two pugs who have had a history of cancer (mast cell tumours), I strive to provide as much high-quality immune-boosting nutrition as possible. One of the many ways I do so is by providing bone broth, a nutrient-packed superfood that is easy to make and affordable. 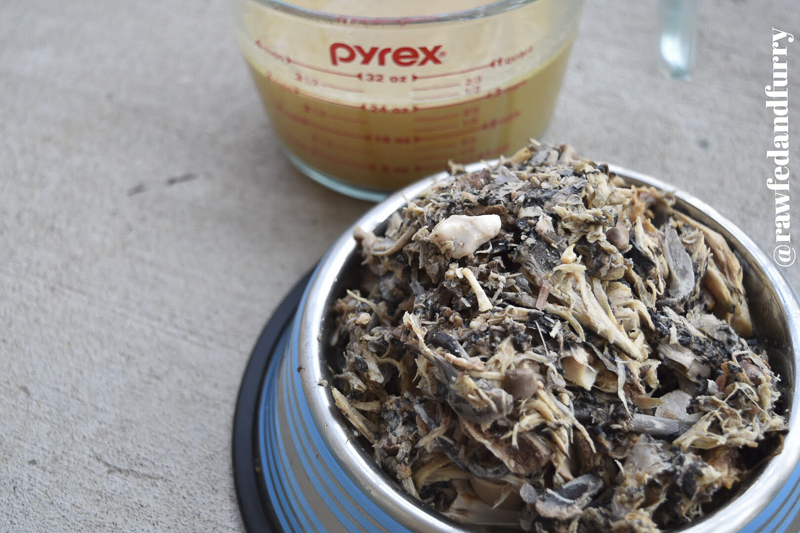 Bone broth for pugs is a great addition to any meal. 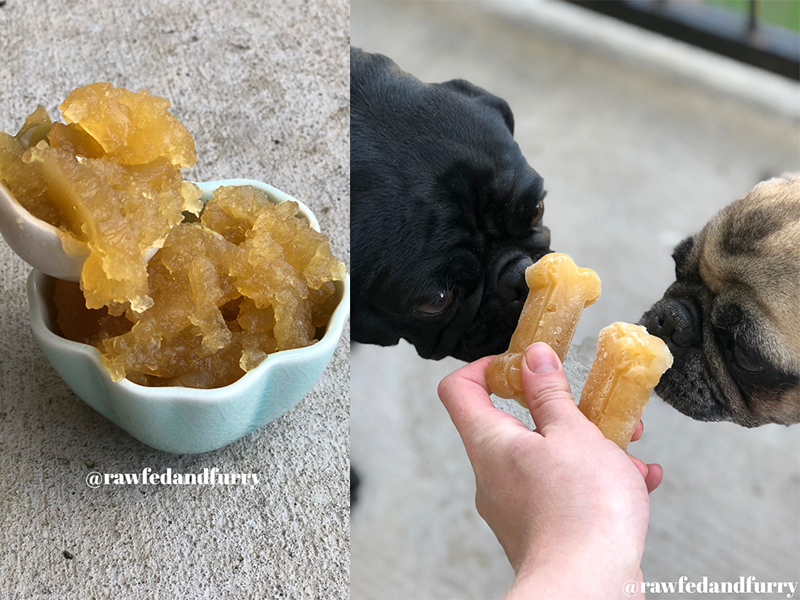 Why feed bone broth for pugs? This easy to digest broth is packed full of important nutrients, such as calcium, phosphorus, silicon, magnesium, and sulphur. It also contains a variety of joint protecting compounds, called glycosaminoglycans. These include glucosamine, chondroitin, and hyaluronic acids. Bone broth is also rich in collagen, which reduces intestinal inflammation and helps heal the gut lining in pets (and people!) dealing with Leaky Gut syndrome. 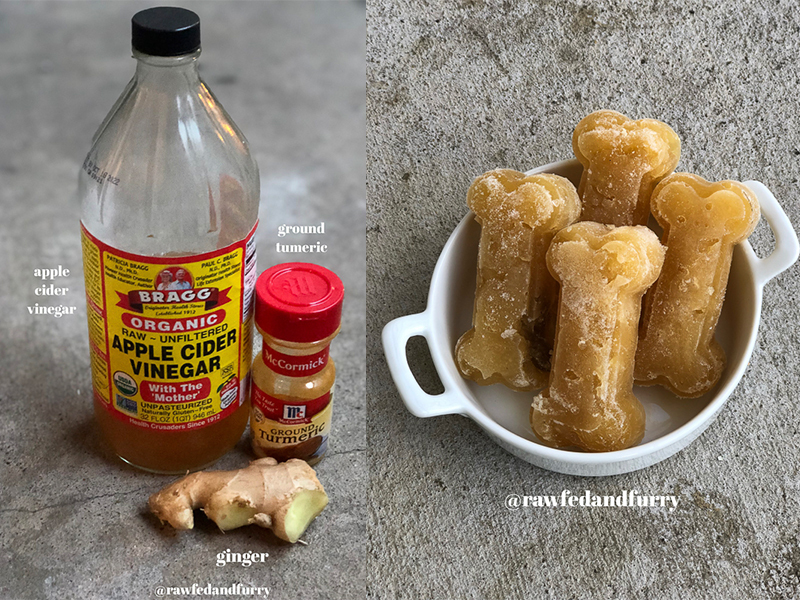 Since bone broth is nutrient-rich, yet easy to digest, it’s a wonderful nutritional aid for sick and elderly pets. 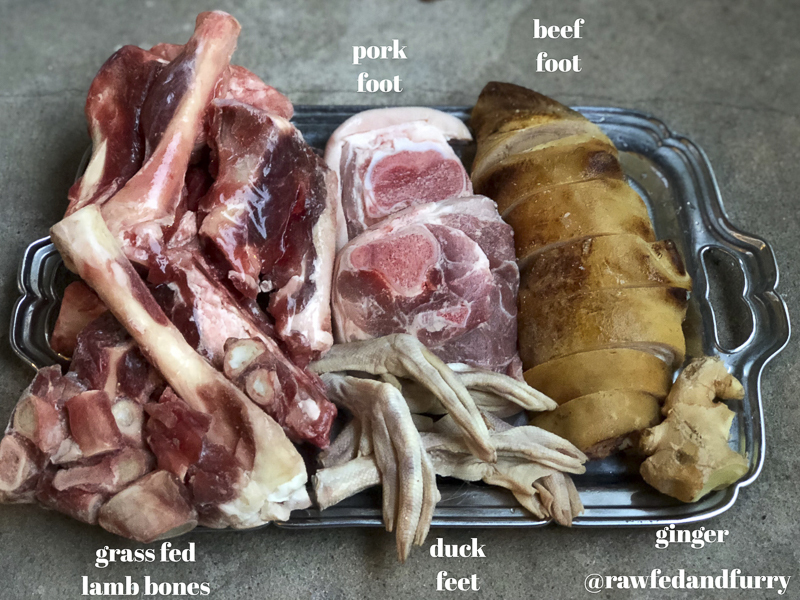 What Bones Should You Use in Bone Broth for Pugs? 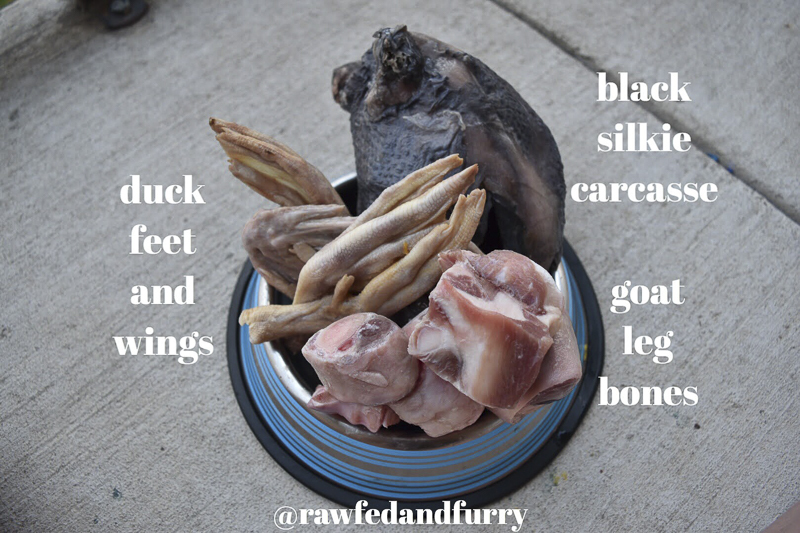 Any type of bone can be used to make bone broth! I prefer to use grass fed bones when possible, as they have higher amounts of the good nutrients we want. But, non-grass fed bones work as well. I always include at least one type of foot in my broth. Feet are an awesome joint filled bone source that is chock-full of the collgan, glucosamie, and other trace minerals that we want. 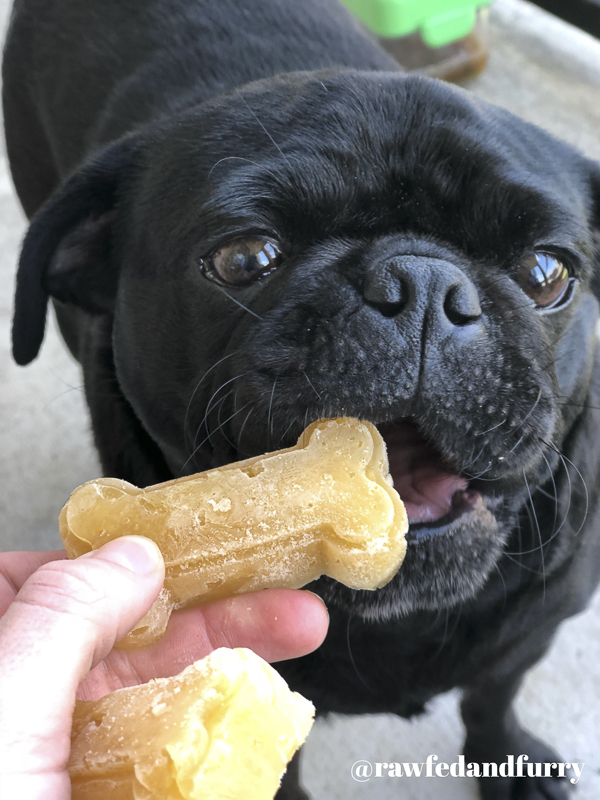 What do you need to make bone broth for pugs? You only need a few simple ingredients to get a good batch of bone broth going. 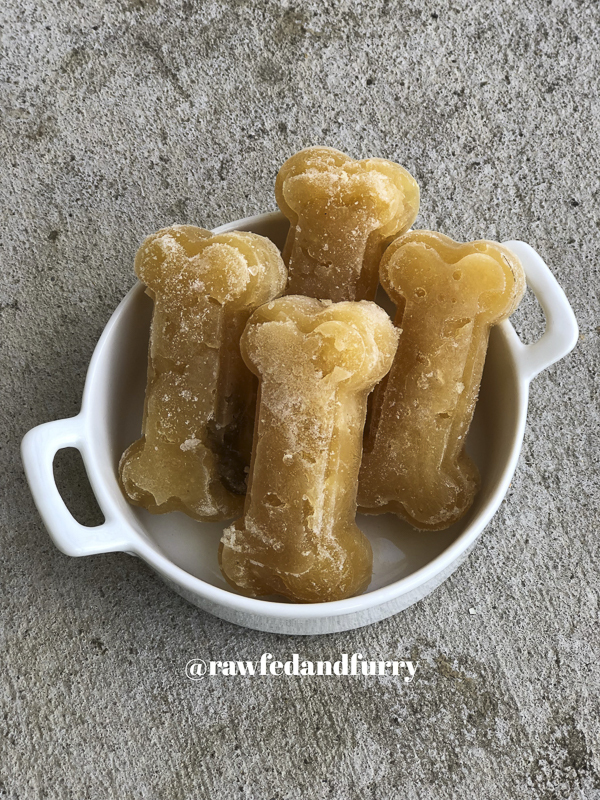 Bones – don’t forget the feet! Apple Cider Vinegar or Lemon Juice – the acid helps pull the good stuff from the bones. 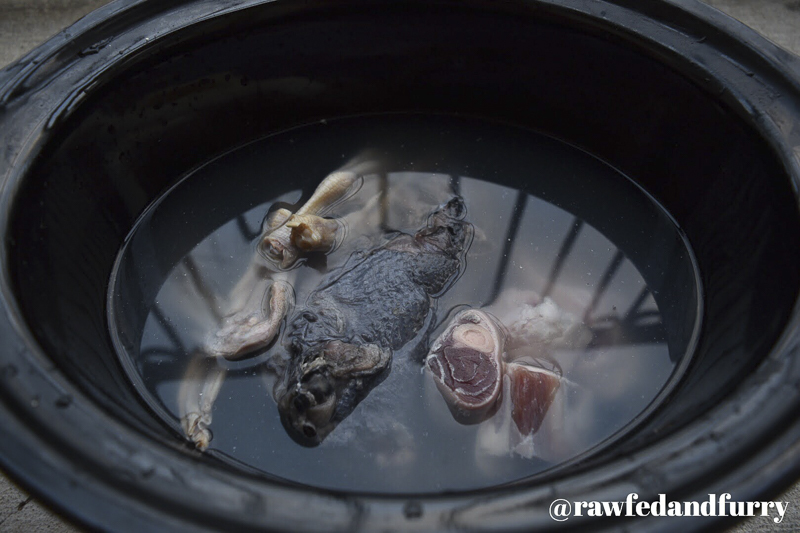 How do you make bone broth for pugs? Place bones in the desired cooking vessel and cover with water. Keep track of how many cups of water you use. Add one tablespoon apple cider vinegar per cup of water used. Cook on high for 2 hours, then turn it down to low for 22 to 48 hours. You want to cook the bones for a minimum of 24 hours if using a slow cooking method. Once the broth has cooked for the desired amount of time, strain and discard bones. Any meat or cartilage can be saved, blended, and used as a meal topper! Once completely cooled, a layer of fat should have formed on top. I remove and discard as much of this fat as I can. 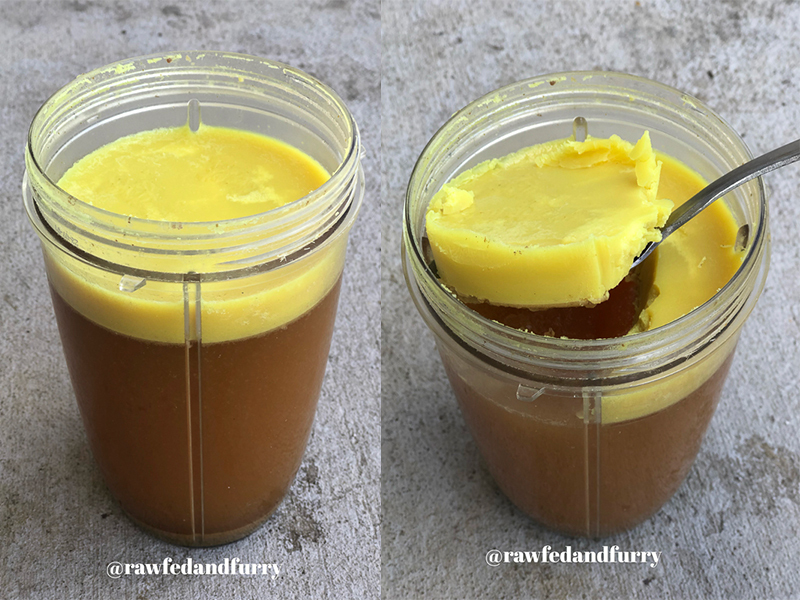 You should now have a nice gelled bone broth! If your broth did not gel -don’t worry, it is still nutritious! Simply add more feet in your next batch. Bone broth can be served warmed, chilled, or frozen. The above recipe can be modified by adding beneficial herbs, spices, and veggies. I like to add ginger and turmeric to some batches to give it an extra boost. How much bone broth should you feed? I give my pugs about a tablespoon with their meals or as treat. I give my larger dogs 2 to 3 tablespoons. 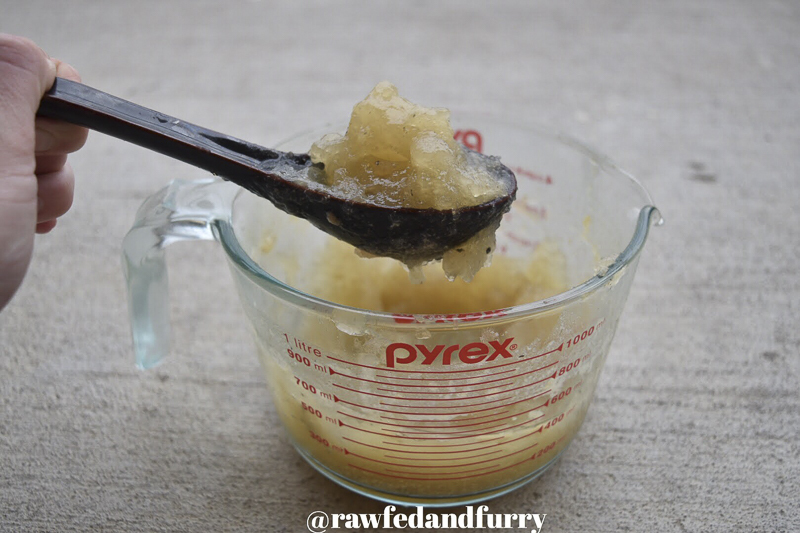 Have fun making bone broth for pugs and leave a comment with how you went with it. An animal obsessed Texas girl with a love for pet care and nutrition. She has over 8 years of working in the pet care industry and has experience with animals of all shapes and sizes.Her goal is to use her knowledge and passion to help others discover the wonderful world of raw food for pets. Megan is also an independent contractor for SoCal Raw Fed Dogs and is a certified raw dog food specialist. Fasting Pugs: Can it be Done? You mentioned that you give a tablespoon of broth to your pug either as a treat or in their food. I just switched my pug, puggle and Rottie to an all raw PMR diet. Loved the idea of the frozen broth but that frozen broth bone looks more than a tablespoon, please advise. Also, I read that pugs should be good on 18% crude protein and no more than 5% crude fat or they can develop pancreatic cancer because they do not digest fat too well. Now, I’m nervous. A tablespoon is just a guide. 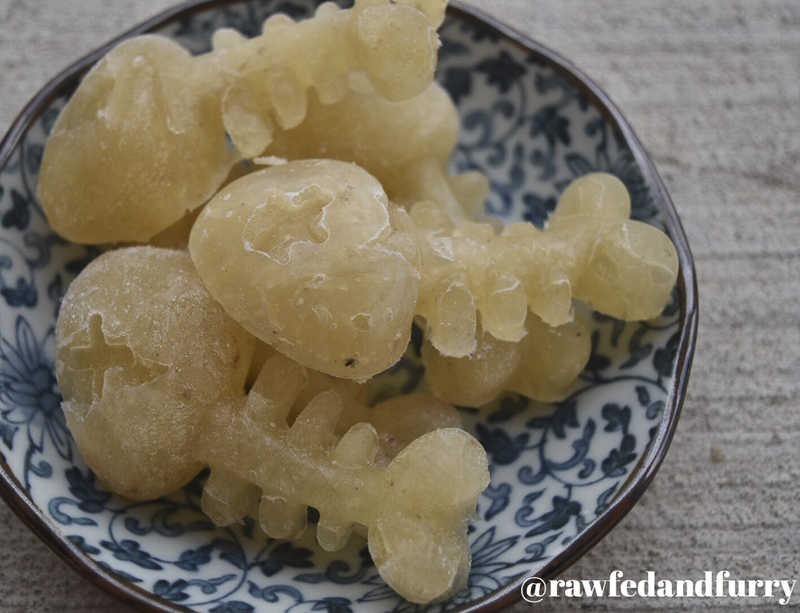 I often feed more than a tablespoon myself and have moulds like those bones Megan used for photos. When I use those, I split the broth between my two pugs. As for the info you mentioned on crude fat percentages, it is something I personally have never heard of. I have heard that pugs should have lean meats to help keep weight off but every pug is different as my boy does better with a bit more fat in his diet than my girl does.